Since I updated Zend-Framework to version 2.5.3 and PHP to version 7.0, I don't always get the full error message if an exception occurs. Oddly enough, sometimes I get the full error message including the stack-trace and everything I need for debugging, but sometimes I only get just that generic error message. Has someone experienced that behavior? Is that normal? Not sure if this is causing your problems but worth mentioning it anyway. You have to configure your view-manager to display/render exceptions. You can read more on how to configure your view renderer inside the ZF2 documentation here. Not the answer you're looking for? Browse other questions tagged php exception-handling zend-framework2 php-7 error-reporting or ask your own question. 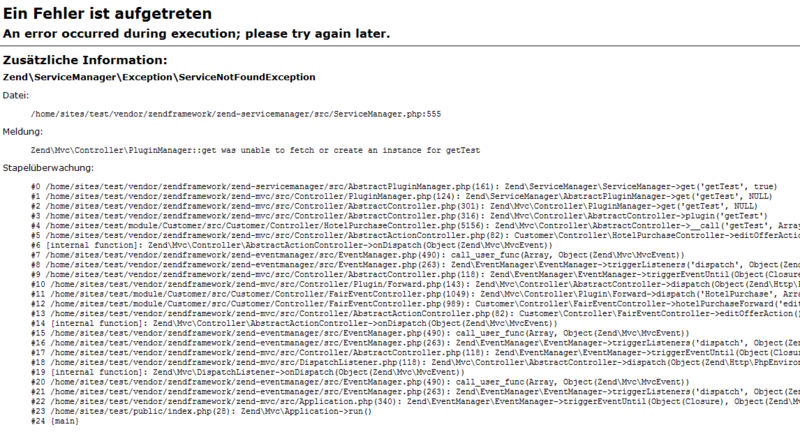 Which types of errors should stop the system, in released php web system? Display all exception messages in zend instead of “An error occurred”?